Does my consort count? If so, yes. The person below me is not intoxicated at the moment. I'm not not intoxicated if that's what you mean. Me love person the is in below with giraffe. get your damn giraffe away from me, naps. god. Tpbm takes a dim view of hollandaise. I get eggs benedict and ask them to hold the eggs, the ham, the muffin... it's all just an excuse to eat hollandaise. But it must have the proper balance of sweet butter to lemon. I don't understand the question. Is it a euphemism, a IED, or the password to Col.Smiley N'Gobo's Swiss bank account? TPBM is a member of the far far-right terror group The Col. Smiley N'Gobo Tendency. No, no. Although the mistake is understandable. 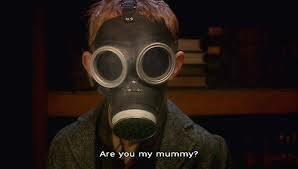 I'm just looking for my mummy. The person below me has an ugly Christmas sweater they love to wear this time of year. I don’t actually and I feel slightly left out. Tpbm has strong feelings about skinny jeans. Yes. I'll probably never wear them again. They remind me of my teens early twenties when I used to dress feminine and put on make up. I'd not wear them again because they signify going backwards into a period when I used to scam people. I'm curious to know if the person above me has strong opinions about skinny jeans. The person below me is trying to improve relationships with their parents.